The new Nissan e-NV200 Evalia is the range-topping model in the e-NV200’s line-up. It’s actually the only full electric multipurpose vehicle on the market today, which means it has no clear rivals. It is, however, a very niche vehicle. It comes available with either seven seats or just five and borrows some excellent technology from the rather excellent Nissan Leaf. It does have its flaws, such as uninspiring styling, and it is a tad on the expensive side. OSV takes a closer look at what it’s all about with our Nissan e-NV200 Evalia review. Electric cars are generally jolly good fun to drive. They’re compact and agile, and quite respond almost instantaneously when you put your foot down. Such is the willing nature of electric motors. However. This e-NV200 – even in the range-topping Evalia guise – taints the shiny picture of electric cars being great fun to drive and injects a bit of grey realism. This is the heaviest EV on the market, which shows that it’s really the size of the EV’s that makes them such entertainers. And because of how big this vehicle is, performance is not great either. Overall, the vehicle fails to excite when on the move. With that said, if you’re in the market for this kind of MVP, you’re probably not too concerned about on the road thrills and spills. Straight-line speed is decidedly unimpressive, while handling is certainly not at all sharp. But these are minor gripes that most buyers will be able to cope with. What’s really irksome is the aforementioned sluggishness of the car. Electric motors are usually livelier, but the e-NV200’s bulky frame suppresses things here. You’re always reminded that you’re in a van too, not least by the upright driving position. In bends, agility is compromised, but you’ll find it a peach when you drive about the town. On a county road, its weaknesses will be exposed. The interior is mostly comfortable, but the material quality is not especially high. From the outside, it looks unsurprisingly clumsy, thanks to the fact that it’s essentially a van-based car. However, it’s certainly not as hard on the eye as, say, the VW Caddy Life, and thanks to a pleasant and friendly front face, it might even be deemed a bit of a looker. Inside, there is a third row of seats if you want them, but they can be difficult to access for adults. In general, head, leg and shoulder room is very good, and you and your passengers should be able to enjoy your journeys in comfort. The fit and finish betrays the car’s commercial roots and is far from top quality. Everything is durable and robust enough, but it’s just all a bit plain and grey. Compared to the classy cabin of the VW Sharan, this one is miles off. Still, the controls on the dash are logically arranged, and accessing them is easy enough. To get the most out of its practicality, you will need to opt for the seven-seater. If you do, you get to choose between more luggage space or more passenger space whenever you need either. The 5-seater is a lot less versatile and flexible and isn’t really any bigger than the hatchback variant. You’re also stuck with a huge boot that may end up remaining half-empty most of the time. With the 7-seater, the boot measures 870-litres when all the seats are up. Fold down the second and third row of seats, and the boot space can be extended to a massive 2,940-litres. This is much more than many of its rivals can offer. However, there is a boot lip that can make the boot slightly less usable. There are seven trim levels available, of which this Evalia model is at the top end. Standard equipment includes automatic headlights, side and curtain airbags, 15” alloys, cruise control and speed limiter, rain sensing windscreen wipers, Nissan Carwings telematics system, and steering wheel mounted audio controls. Prices for the new car go as high as £32,000. If you want to lease the car, you’d be looking at paying somewhere between £175 + VAT per month and £490 + VAT per month dependent on trim, specifications and contract length. It’s an electric car, so it’s unsurprisingly cheap to run. But unlike diesel or petrol-ran alternatives, this one is more expensive to buy in the first place. It’s very much a case of apples and oranges. The basic seven-seater, for example, can cost you up to £27,000 even after you’ve taken off the £4,500 government EV grant. You can take a bit of the edge off things by renting the vehicles’ batteries from as low as £70 per month. The exact amount you pay will be dependent on a few factors, such as ownership period and expected mileage, and could be as much as £130 per month. It takes eight hours to charge and is free from VED and the London congestion charge. If you’re a typical MPV buyer, the e-NV200 Evalia might not make a great deal of sense. Resale values are not promising, and it’s very much a car tailor-made for taxi companies – that sort of thing. The car is also lacking in advanced safety systems. For example, there is no lane-departure warning and no automatic braking. There is, however, tyre pressure monitoring, traction control and plenty of airbags. Euro NCAP, meanwhile, awarded it three out of five stars for safety. There quite simply isn’t another car like this on the market right now, which is a very good unique selling point. The biggest electric van available, it’s essentially in a class of its own. The seven-seater is undoubtedly more practical, but the five-seater will work just fine if you have no need for those extra seats. The Nissan Leaf is a very astute car that comes with lots of advanced technology, some of which is shared here, including CarWings. It also benefits from the Leaf’s gloss black central section, which integrates your radio, air conditioning and satellite navigation. The exterior styling is not a “love it or hate it” kinda thing, because very few buyers will admit to loving it. Based on a van, it was never going to be the fairest in the land. Low running costs are the order of the day, but you will have to pay much more for this outright than most of its diesel and petrol-engined rivals. The Nissan might be dirt cheap to run, and it might be a one of a kind. But are there better alternatives? 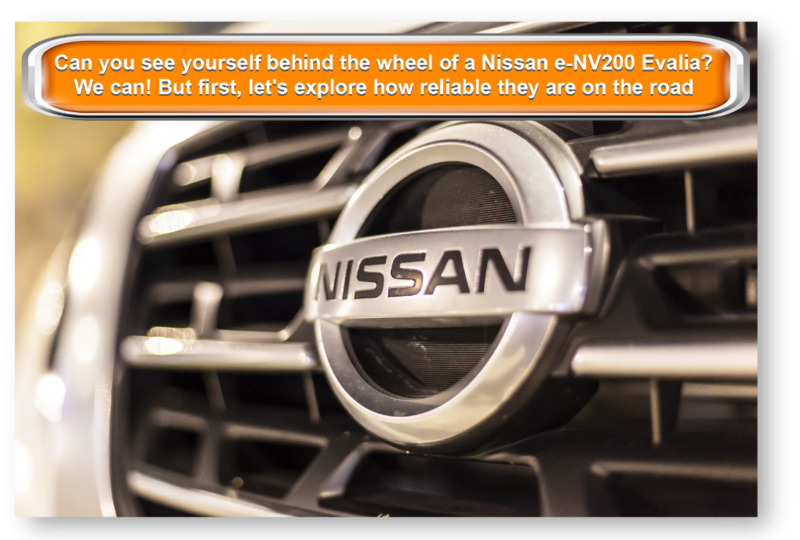 Let’s find out in the comparison section of our Nissan e-NV200 Evalia review. 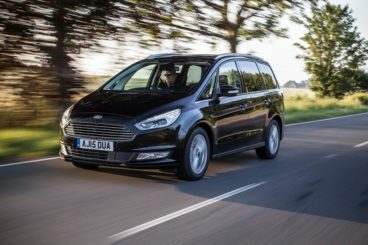 The new Ford Galaxy is as practical as they come. Like the Nissan, it doesn’t major on style, but it’s very good to drive. Despite its size – and the Galaxy is BIG – it’s actually an adroit handler. It’s more comfortable than performative, which is understandable, but like all Ford’s it offers more entertainment than most of its peers. The suspension is well judged, body lean is minimal during bends, and our worst bumps and lumps are absorbed well. From a driving point of view, MPV’s don’t get much better. There is a selection diesel and petrol engines to choose from, with a 2.0-litre TDCi 148bhp diesel unit shifting most of the units. It can get from rest to 62mph in 10.9 seconds, but a more powerful 178bhp variant covers the same distance in 9.8 seconds. There is also a 207bhp, which completes the sprint in 8.9 seconds. There are a pair of petrol engines available; they’re not really suited to this car. And although they’re fairly quick, they’re also thirsty. The 1.5-litre 158bhp EcoBoost can only achieve fuel economy returns of 43.4mpg while the 2.0-litre 237bhp EcoBoost unit returns 35.7mpg. The diesel units, conversely, achieve fuel economy returns just above 50mpg. 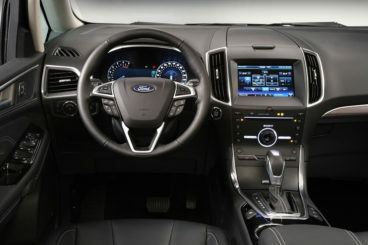 The interior is much more comfortable and luxurious than last time around. The cabin is forged from higher quality materials, and an aluminium trim is a particular highlight. You will find the odd bit of scratchy plastic here and there, but on the whole, it’s a pleasing place to be. Moreover, everything feels durable and robust. Like the Nissan, there is space in here for seven adults. Its interior is spotted with various cubbyholes here and there, while the versatile seating arrangement helps to make it one of the most practical cars in its class. Access is easy, and the boot measures 300-litres. Fold the second and third row of seats down and you can extend this to 2,020-litres. The new Volkswagen Touran isn’t what you’d call exciting, but neither are most cars in this class. It’s hugely practical and very accomplished. The Volkswagen Touran is easy to drive. It’s not very thrilling, and it might be a bit too noisy out on the motorway for some of you, but it takes car of rural and urban roads without much fuss. It doesn’t weigh as much as its predecessor, with the result being that it’s a little nimbler. There are petrol and diesel engines available. And while you might not have looked twice at the petrol options in the past, turbocharged technology means that they’re growing in popularity. The diesels, though, are still better suited to the nature of this car. A 1.6-litre unit is our top pick, and it completes the 0-62mph dash in 11.0 seconds. The 2.0-litre diesel unit is a better bet if you’re to be regularly travelling on a full load of seven people, though. Modern turbocharged tech has really helped to keep the running costs down, as has a reduction in weight. 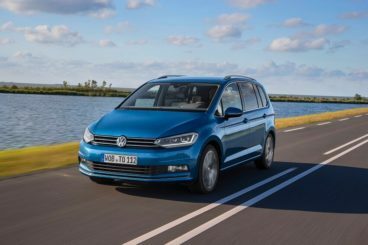 VW claim the Touran is now 19% more efficient than its predecessor. It isn’t exempt from road tax, though, so whichever engine you choose, you will have to pay your share. The most frugal in the range is the 1.6-litre TDI DSG unit, which achieves returns of 65.7mpg. The petrols don’t fare too badly either, with the most efficient good for 52.3mpg. The Touran’s interior is a classy affair, and the slickness of the cabin mirrors the slickness of the exterior styling. You get full smartphone connectivity with certain models, while an intuitive infotainment system is a real highlight. The seats are comfortable, and the lightly coloured dashboard feels top notch. The Touran is also really practical. Head and legroom is enhanced by a high roofline, but the third row of seats isn’t really for adults. According to VW themselves, there are 37 storage cubbies inside here, but it’s kinda hard to find 37. We found 22. The glovebox is decently sized, while a fold-out table is a clever touch. The boot, meanwhile, is measured at a whopping 743-litres with all the rear seats in place. This van-based car is absolutely huge, and in all honesty is only worth buying if you really need all that space. With that said, there is a lot to like about it. 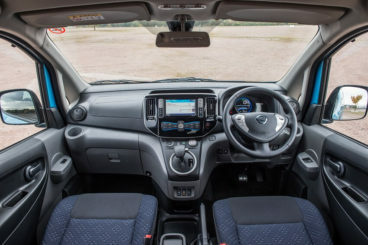 It’s certainly one of a kind, being the only fully electric multipurpose vehicle on our roads at the moment, and it’s got plenty of interior room and practicality. Indeed, the Nissan e-NV200 Evalia is head and shoulders above its EV rivals, and if you love our planet it makes for an awesome choice. 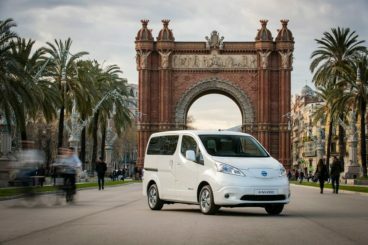 Looking For A Price For The Nissan e-NV200 Evalia?